From the Sunday Times top ten bestselling author of The Psychopath Test, a captivating and brilliant exploration of one of our world’s most under-appreciated forces: shame. ‘It’s about the terror, isn’t it?’ ‘The terror of what?’ I said. ‘The terror of being found out.’ For the past three years, Jon Ronson has travelled the world meeting recipients of high-profile public shamings. The shamed are people like us – people who, say, made a joke on social media that came out badly, or made a mistake at work. Once their transgression is revealed, collective outrage circles with the force of a hurricane and the next thing they know they’re being torn apart by an angry mob, jeered at, demonized, sometimes even fired from their job. A great renaissance of public shaming is sweeping our land. Justice has been democratized. The silent majority are getting a voice. But what are we doing with our voice? We are mercilessly finding people’s faults. We are defining the boundaries of normality by ruining the lives of those outside it. We are using shame as a form of social control. 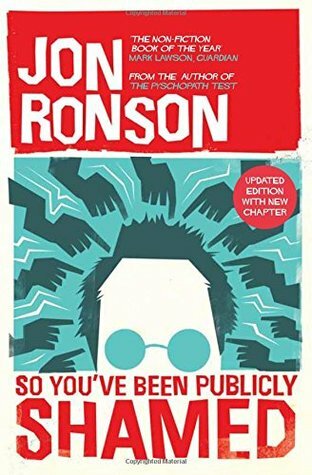 Simultaneously powerful and hilarious in the way only Jon Ronson can be, So You’ve Been Publicly Shamed is a deeply honest book about modern life, full of eye-opening truths about the escalating war on human flaws – and the very scary part we all play in it. This edition includes a new chapter about Jon Ronson’s own public shaming, encountered thanks to the publication of this book. I can’t rave about this book enough. No matter how much I have raved about any book on this blog, this is one book I think everyone must read. And I kid you not, with that bolded out statement. I am deadly serious. If you’re using social media, then you need this book in your life and you need to read it quickly before you keep typing into your tweet stream or Facebook feed. It’s that important. I was already aware of the power of social media before I read it. It was one of the reasons I picked it up from the shelf in the bookshop. I’d heard about it and had an understanding of where it was coming from. We’re a society using public shaming to control people/organisations/governments. To make change happen. It can be for the good. But when directed at a single individual, it can be terrifying. Have you ever heard of someone who has hurt a friend on social media by their words or actions and then gone on to castigate them for it, making it public so others can see the error of their ways? Or have you seen a wrong doing already circling and shared the tweet or Facebook post, sharing the outrage? It’s this simple act. You/me, a single person, who makes the whole monster. A monster who is uncontrollable and who, actually, the offending person, really doesn’t deserve that level of anger. Yes, they may be an ignorant idiot, but fired from their job? Don’t kid yourself. One guy in this book was at a conference, sat with a friend, he made a remark that could have been taken as sexual innuendo (to his friend) about the slide on the screen in front of them (a dongle joke – it was a tech conference). A woman sat in front turned around, took his photo, indignantly tweeted it and it went viral. He lost his job. Was he wrong? I don’t know, maybe if she was really that offended, then he should have thought about how loud he was speaking or if it was an appropriate place etc, but did he deserve to be publicly shamed and lose his job? Absolutely not. Now, you may say you wouldn’t tweet something like that, but this weekend I saw a Facebook post where a woman was rude on a plane. She’d been rude to a family who had a child with an invisible illness (autism). She’d said can they shut that kid up. A few times I believe. Yes, she was rude. – But, the family took her photo (side profile) and shared a Facebook post saying they hope she was sleeping well because their daughter was distressed and in the hospital, hashtag autism (because obviously that was going to get more shares – cynical, me?) It had, when I saw it, 106 thousand shares on Facebook. The family, if they felt like voicing outrage could have simply created the same post but without the photo and it would have had the same impact for them, the same sense of outrage and disgust that they felt someone had behaved badly to them and their daughter, but adding the photo and potentially identifying her adds a whole other realm to it. I once read and shared a blog post where an invisibly disabled woman wrote an open letter to another woman who had tutted at her for using a disabled toilet. It was an amazing blog post. She was using a colostomy bag that was full to bursting and the other toilets were full and if she hadn’t rushed into the disabled toilets there could have been a real mess (if I remember it correctly). A powerful post, identifying a problem in society, without the need to publicly castigate the specific individual. Where we think we are sending one tweet in support, we are actually building a momentum, an avalanche, a deluge that sweeps away the person at the other end. It completely washes them away. Yes, Twitter is great for getting big organisations to listen to the masses, but not to target an individual. It smacks of playground bullying in the extreme. This is an interesting TED talk by Ronson on one of the topics in this book. It does sound interesting. I think the shaming thing has gone way too far. Again, the media, be it social media, controlling the masses through fear. Some of the stories in this book are just extraordinary. You wouldn’t believe how far these things can go. I was shocked.